Keep a record of who still owes you money (called accounts receivable) and send reminders every 30 days. If a business (or individual) is past due more than 60 days, do not continue doing business with them until they have paid off their current balance. Treating a worker as an independent contractor when he or she should be classified as an employee is a serious mistake with tax consequences. The IRS takes worker misclassification very seriously. It has implemented a system where a worker can file a complaint against an employer. If the employer misclassified the worker without reasonable cause, they will be held liable for employer taxes on that worker. Read more at the IRS website, www.IRS.gov, by typing ‘worker misclassification’ into the search box. QuickBooks is a great software program, if used correctly. The old adage, “garbage in, garbage out” applies to QuickBooks. Make sure you are properly trained in its use. Tutorials, on-line assistance, and books such as QuickBooks For Dummies can be very helpful. You can also hire someone to set up the software for your particular needs. Knowledgeable QuickBooks experts in your area can be found at http://proadvisor.intuit.com/referral/. Avoid mixing income and expenses in the same QuickBooks account, because you will not have an accurate picture of your income, nor you expenses. For example, say you attend a convention and sell some of your books, but also incur travel expenses. If you mix these transactions into the same account called “Conventions,” you will not have accurate data on the income made or the expenses incurred. Your accountant will spend needless hours untangling your transactions to prepare your tax return. Mixing business and personal expenses in the same checking account or Paypal account can lead to a lot of confusion. The IRS may consider your personal deposits as business income in an audit if you cannot prove otherwise. Keep your business and personal expenses in separate checking accounts. Need help with your record keeping or worker classification issues? 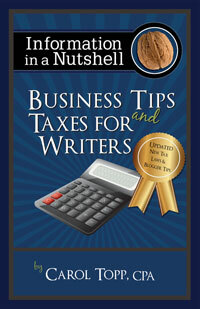 I offer a business and tax consultation service for writers if you do not have a local CPA that you trust. Contact me through my website.